In a variable ratio schedule a desired behaviour (once it is established and put on cue) will be reinforced randomly. There is no way the horse can predict when he can expect a reward, so this will keep him motivated to perform well. With a variable ratio schedule it will take a very long time before a behaviour will become extinct. Extinction means that the behaviour will no longer be displayed in a certain situation. There is 0% chance of a reward so therefor the behaviour has become ‘useless’ in that situation. A variable ratio schedule is the most powerful reward schedule. Your horse figures ‘This could be the time my behaviour gets rewarded, so let’s try this again’. No reward? ‘Maybe this time I will get a reward… Let’s give it a bit more effort… Yes! It worked’. A variable reward schedule is also the reason why most horses keep displaying undesired behaviours. I explain this further in this post. If a behaviour is never rewarded (intrinsically or extrinsically) it will go extinct. 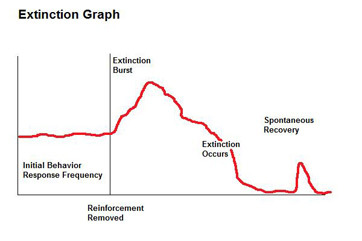 Just before a behaviour goes extinct there is usually an ‘extinction burst’. The same principle occurs in a consciously applied variable reward schedule. Just before the horse loses interest in displaying the behaviour he will show a little ‘extinction burst’ as a last attempt to influence the reinforcement (reward). This is the improved behaviour a trainer is looking for and wants to mark and reward. If the horse already has a strong positive reinforcement history with a certain behaviour or with positive reinforcement training in general, it can react differently to a withdrawn click than when he is in the beginning of the learning stage of an exercise. A well used withdrawal of the click will induce an improvement of behaviour (extinction burst). It also can help the horse figure out quicker which behaviour is rewarded and which isn’t. In this way you can give more information about what you want. Instead of the trainer acting like a ‘vending machine’: put money (behaviour) in and expect a reward (treat comes out), the trainer now behaves more like a ‘gambling machine’ with a fair chance to win. The horse may become ‘superstitious’ and tries to figure out if there was a difference with the behaviour that was similar and didn’t get rewarded and the one that did. Just like superstitious people who are suddenly paying attention to the colour of their socks in order to influence their chances of winning, the animal will also pay more attention to the details of the behaviour in order to influences the chances of a click and reward. Withholding a click can also trigger impatience, frustration or confusion in the horse. So use this technique with caution. You don’t want to discourage your horse. A little bit of frustration is no big deal, as long as the horse stays in learning mode. Sometimes a bit of frustration can actually benefit the learning process. It is the trainers responsibility to walk this line. If the horse gets frustrated or shuts down, turn back to a continuous reward schedule for a while and make your training steps smaller and lower your criteria. When you start teaching a new behaviour it is really important to click every improvement and use a continuous reward schedule. The next step in training should be only rewarding the behaviour when you have cued it. Once the cue is established, switch to a variable reward schedule. So once your horse has learned a specific behaviour you can reward less and less and still get the behaviour. This is called fading out the click. Continuous reward schedules are very easy to use (reward 100%) because you don’t have to think about it. What about a variable reward schedule, are you using this in your training?